CHICAGO, IL – FEBRUARY 7, 2019 – Advanced Resources, a talent solutions organization providing staffing, consulting, and workforce solutions, has been recognized by ClearlyRated, earning the Best of Staffing® Client and Talent Awards for the tenth consecutive year. Best of Staffing winners are proven industry leaders in service quality based solely on the ratings given to them by their clients and the people they’ve helped find jobs. 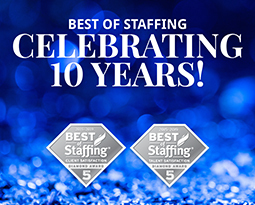 Advanced Resources is one of four staffing firms in the U.S. and Canada to win the Best of Staffing Client and Talent award every year since the program began in 2010. The program utilizes Net Promoter Score (NPS)-based surveys. A Net Promoter Score (NPS) is a simple metric based on a question that asks how likely a person is to recommend a company. Advanced Resources received a client NPS of 77.1% and talent NPS of 70.4%, compared to the industry average of 11% and 24%, respectively.